Long before the time when toys were made predominantly of plastic or other manmade materials, wood was the material of choice for toy crafters and manufacturing companies around the world. Toys then felt solid, sturdy, and could last for generations – so take advantage of the vintage look and feel of real wood toys by ordering from our catalog of classic wooden toys today! Tin Toy Arcade makes it easy to find the best woooden toys for kids and adults alike. From board games to wooden blocks, wooden figurines to classic pub games, you’ll find nostalgic wooden toys that will thrill young kids and bring out the inner child in you, too! Order today and your kids will hardly be able to wait until their new wooden toys arrive. Fun, fascination, and education - that’s what Tin Toy Arcade is all about! 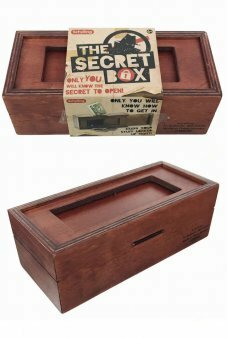 Only you know the mystery to open the Secret Box ! Store money, valuables, or anything that fits In the stained all natu.. The Pirate Pistol Rubber Band Gun loads and shoots 12 bands for rapid fire action! Our Musket style rubber band shooter .. The Rifle Rick Western Rifle Rubber Band Gun loads and shoots 12 bands for rapid fire action! Our Carbine Lever Action s..